Do you love Star Wars? I grew up with brothers who absolutely loved the Star Wars series and went to every one of the movies in theaters. While I may not be as big of a fan as they are, I still love the series. When I heard that Petco was coming out with their own line of Star Wars toys, I thought it would be perfect for our pets! I mean, come on, we are a couple of geeks, so why shouldn’t we have pet geeks too? To say the least, I was super excited when Petco sent me a box with three adorable toys from this collection! Oh my, this toy truly is adorable. I don’t think I have ever seen Darth Vader as a ‘chibi’ before (yes, my Japanese anime interests are showing). Ever since I took this toy out of the box Reya has been obsessed with it. This soft plush has a squeaker inside its large head and seem to be double stitched in a way to make it last even big dogs like mine. 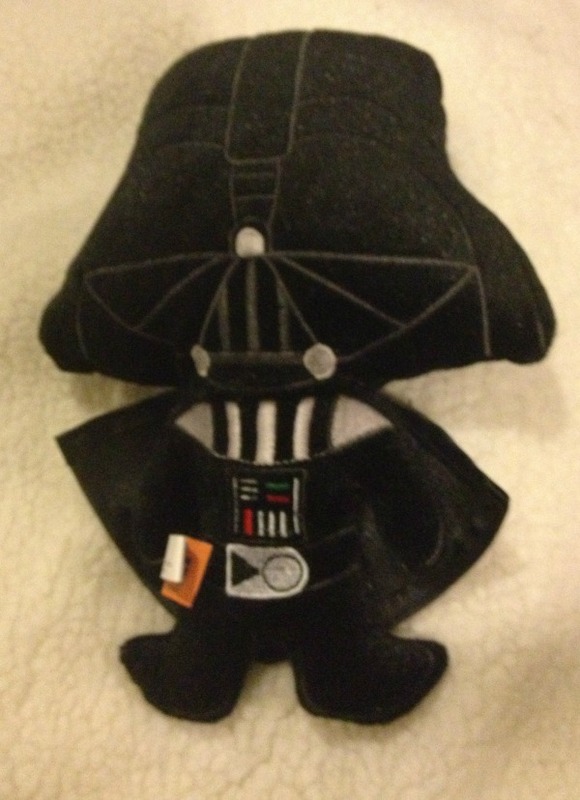 All the details on this Star Wars Darth Vader Plush Dog Toy are also embroidered, making it safe for dogs of all sizes. This is right now Reya’s favorite toy and she loves carrying it throughout the house! It seems my dog is a Star Wars fan too! This is another item that was just too cute that drove our cats wild. The Star Wars TIE Fighter Cat Teaser is like your traditional feather teaser, but with a TIE fighter that rattles. What I really loved about this Star Wars toy was that it came with an extra long handle, allowing you to sit down while your cat has fun chasing this thing. 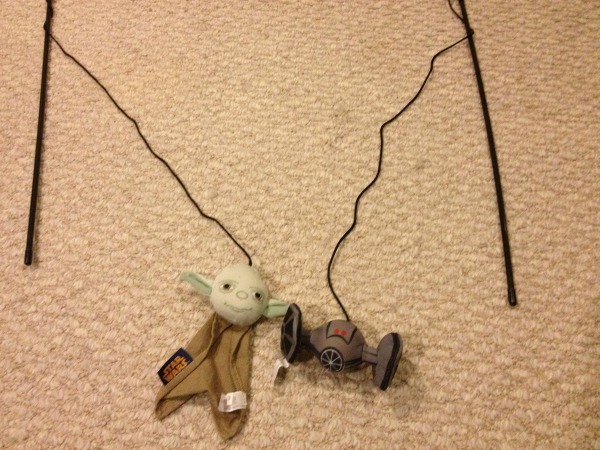 Along with the TIE Fighter, I also received a similar toy that had Yoda instead of the fighter. Both are cute and loved by my family’s cats! Would you love to purchase some of these adorable Star Wars toys for your favorite pets? All of these great toys can be found at your local Petco store or on Petco.com. With all the wonderful toys in their Star Wars pet collection, your pets can become Star Wars fans too! I would love to get this for our dog, but I'm sure she would just rip it to shreds (she's a black lab, retriever mix)! I have a huge Star Wars fan on my list this is adorable! really cool I wish I had a cat. We named out dog Rex after Captain Rex on The Clone Wars. My kids both loooove Star Wars, it is a family favorite! Those are cute! I have a brother in law who loves everything star wars, and i am sure he would love these for his pets! Oh my goodness, these are so awesome! 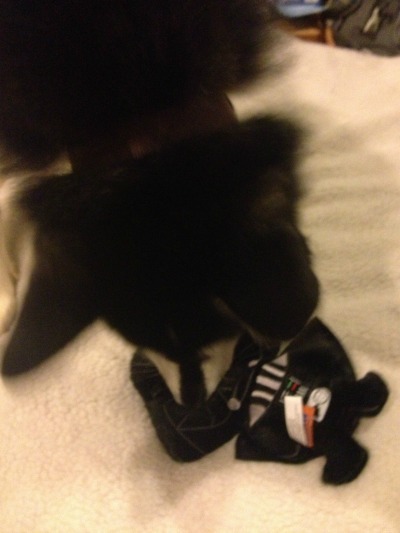 I can think of a dog or two who wouldn't mind ripping plushie Darth to shreds! I also love how easily available and affordable these toys are. These are cute. Thank you for sharing.